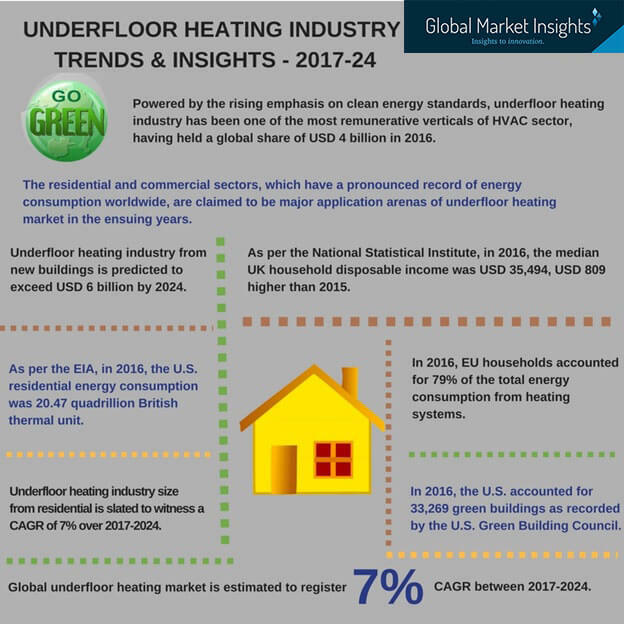 Underfloor heating market has evolved with extreme alacrity over recent times, as big shots involved in the competitive arena have shown quite some proactiveness in strengthening their position in the strategic landscape. Amidst the fierce competition, these giants have been readily banking on product innovation via M&As, and high level of investments in technology platforms, which as per experts’ conjecture, is bound to bring a massive turnaround on the profitability quotient of underfloor heating industry. A vital instance that is impeccably testifying the aforementioned declaration is the recent launch of LevelDek, an absolutely state-of-the-art underfloor heating system within a batten & cradle structure. Reportedly, the new launch comes on the heels of the strategic collaboration between two of the eminent underfloor heating market giants Jupiter Heating Systems Ltd and New Era Floor Systems. The changed underfloor heating industry outlook is set to bring a new trend in the overall business model. The increasing deployment of underfloor heating systems across high-end residential ventures has thus necessitated the requirement of lightweight solutions with least compromise on the design quality. The latest collaborative launch by New Era Floor Systems and Jupiter Heating Systems, is claimed to function alongside these expectations. In fact, LevelDek has already sent out a wave of anticipation in the underfloor heating industry, given the fact that it has marked the onset of a new era of raised underfloor heating system. The incessant efforts undertaken by the companies to bring pathbreaking innovations in underfloor heating market is claimed to be significantly influenced by the increasing rate of disposable incomes at a global scale. As per reports put forth by the National Statistical Institute, the median household disposable incomes across UK, in 2016, was recorded at USD 35,494, which as per estimates, is almost USD 809 higher than that recorded in the year 2015. The astoundingly rising income curve is prompting manufacturers to come up with state-of-the-art high value energy efficient heating systems, thus creating a lucrative growth avenue for underfloor heating industry. In fact, on a broader scale, what is standing out from this driving factor is the profound macroeconomic transformation across major economies, quite overtly conspicuous from the exponential rate of rural migration to urban belt since the last few years. As per estimation claimed by United Nations Department of Economic and Social Affairs (UN DESA) urbanization along with overall growth, would include 2.5 billion people under the canopy of urban population by 2050, with pronounced growth in Africa and Asia. With significant economic development along with subsequent improvements in living standards, energy consumption in the building sector is bound to escalate, setting the stage lucrative for underfloor heating industry growth. Pertaining to the globally prevalent energy efficiency standards throughout the regulatory landscape, underfloor heating industry has been gaining much of an attention lately. As per the recent U.S. EIA report, in 2016, nearly 40% of the nation’s overall energy consumption was generated from the commercial and residential sectors. In 2015, Europe’s household sector is reported to have accounted for almost 25% of the total energy consumption, according to the European Commission. Against the backdrop of this declining environmental scenario, estimates depict that a significant abatement of carbon dioxide emission can be achieved through better insulation and building envelope. The Government of Germany has introduced Energy Saving Ordinance in a bid to reduce carbon footprints from commercial and residential infrastructure- a move that might promote deployment of energy efficient underfloor heating systems. In fact, estimates depict, the referred two verticals account for almost 25% of the nation’s carbon emissions, which itself validates the vigorous initiatives being undertaken by the regional government bodies. Add to it, under the 2012 Energy Efficiency Directive proposed by the European Union - every year the regional government should carry out energy efficient refurbishment activities in at least 3% of government organizations across the European countries. Analysts speculate this to be a vital factor responsible for the prominent growth in Europe underfloor heating industry over the past few years. The Saudi Arabian Government has recently made it to the headlines with its planning of investing almost USD 20 billion in U.S. for upgradation of existing infrastructure. According to analysts, these kind of appreciable refurbishment projects would substantially upscale the regional underfloor heating market demand, given the fact that it is basically initiated with an aim of bringing significant economic and environmental benefits. The aforementioned initiatives are evidence enough to affirm that underfloor heating industry is regulatory driven. As on lately though, the marketplace has been witnessing a transformative trend characterized by the wave of acquisition activities underlining the competitive landscape. Below mentioned are a glimpse of some of the recent developments prevailing in the underfloor heating market. In February 2017, Elta Group, one of the most acclaimed players in underfloor heating market, has acquired an UK based specialist engineering firm, Acoustica. As claimed by the reliable sources, the procurement is expected to stronghold the former’s position in the competitive scenario with a better portfolio of noise control products and enhanced production facilities. Citing yet another significant agreement that is reported to have left a profound impact on the competitive arena of underfloor heating industry is the acquisition of ECR International by BDR Thermea. Reportedly, through the deal, the Netherland based Dutch heating manufacturer is indulging its long-standing goal of expanding their share in U.S. underfloor heating industry. Considering the aforementioned axioms, it is quite coherent to mention that underfloor heating industry is set to explore a slew of opportunities in the coming years, on a global scale. Implementing these systems not only assures comfortable thermal conditions, but is also claimed to be an astute investment from the perspective of environmental health. Of course, the market’s full potential can only be realized through joint efforts from both private entities as well as governmental organizations. However, in all likelihood, with the envision of attaining a carbon-free environment across emerging economies along with numerous research activities addressing the same, underfloor heating market is bound to reach remarkable stature in terms of revenue and product innovations. Estimates by Global Market Insights, Inc. forecasts global underfloor heating industry size to exceed a valuation of USD 8 billion by 2024.